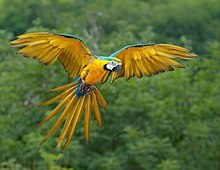 Parrots are birds of the order Psittaciformes. There are about 372 species in 86 genera. They are found in most tropical and subtropical regions. The greatest diversity of parrots is found in South America and Australasia. They form the most variably sized bird order in terms of length. The smallest of the parrots is the pigmy parrot (Micropsitta pusio) with an adult weight of 11.5 grams (0.41 oz) and a length of 8.6 centimetres (3.4 in). With a length (from the top of its head to the tip of its long pointed tail) of about 95 to 100 cm (37 to 39 in), the hyacinth macaw (Anodorhynchus hyacinthinus) is longer than any other species of parrot, although half that length is tail. ↑ "Psittacine". American Heritage Dictionary of the English Language. 4th ed,. Houghton Mifflin Company. 2000. Archived from the original on 2007-08-27. Retrieved 2007-09-09. ↑ "Psittacine". Merriam-Webster Online Dictionary. Merriam-Webster. Retrieved 25 June 2013. ↑ Iwaniuk, Andrew 2004. "This bird is no airhead". Natural Sciences and Engineering Research Council of Canada. Retrieved 2007-09-09. ↑ Beynon, Mike 2000. "Who's a clever bird, then?". BBC News. Archived from the original on 2007-09-01. Retrieved 2007-09-09. ↑ Forshaw, Joseph M.; Cooper, William T. (1981) [1973, 1978]. Parrots of the World (corrected second ed.). David & Charles, Newton Abbot, London. p. 149. ISBN 0-7153-7698-5. ↑ E. Hagan (2004). "Anodorhynchus hyacinthinus - hyacinth macaw". Animal Diversity Web. Retrieved 26 June 2013. ↑ Snyder N et al 2000. Parrots: status survey and conservation action plan, 2000-2004. Chapter 1. vii. IUCN ISBN 2-8317-0504-5. Chapter 1. vii. ↑ Snyder N. et al 2000. Parrots: status survey and conservation action plan, 2000-2004. Chapter 1. vii. IUCN ISBN 2-8317-0504-5. Chapter 2. page 12. ↑ Suh A, Paus M, Kiefmann M, et al (2011). "Mesozoic retroposons reveal parrots as the closest living relatives of passerine birds". Nature Communications 2 (8): 443–8. doi:10.1038/ncomms1448. PMC 3265382. PMID 21863010. http://www.nature.com/ncomms/journal/v2/n8/full/ncomms1448.html. ↑ Dyke GJ, Cooper JH (2000). "A new psittaciform bird from the London clay (Lower Eocene) of England". Palaeontology 43 (2): 271–285. doi:10.1111/1475-4983.00126. Wikimedia Commons has media related to Psittaciformes. Wikispecies has information on: Psittaciformes. "Parrots (Psittacidae)". Internet Bird Collection. Retrieved 25 June 2013. This page was last changed on 5 March 2019, at 10:12.